We have just returned from our holiday. We really had a wonderful time. The staff, especially the entertainment team were brilliant. The food was good, with plenty of choice. Entertainment shows were really enjoyable. The hotel itself was kept very clean and the room was cleaned daily. I have been to Ibiza many times and believe this hotel and the area is one of the best. The area itself is not for people whom enjoy shopping or nightlife but for just relaxing, walking (hilly)and great views it's wonderful. We have just returned from our holiday. We really had a wonderful time. The staff especially the entertainment team were brilliant. The food was good, with plenty of choice. Entertainment shows were really enjoyable. The hotel itself was kept very clean and the room was cleaned daily. 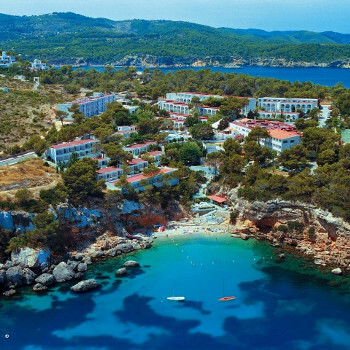 I have been to Ibiza many times and believe this hotel and the area is one of the best. The area itself is not for people whom enjoy shopping or nightlife but for just relaxing, walking (hilly)and great views it's wonderful. This hotel is advertised on Low Cost Holidays web site twice. One says its three stars (which it just about is on a good day) and one says its four stars. The costs are different as well, despite it being the same hotel. The rooms are terrible. Very small, some have no front doors, you enter via a patio window that cant be locked securely from the inside, because the door frame has been forced. NOT secure if you have children with you. The bathroom doors don't close properly, they jam against the floor. The bathroom windows don't shut securely so insects come in of a night time. The silver has come off the bathroom mirrors as they are that old. The room was so bad we had no choice but to pay for an upgrade and were charged an additional £200 for ten nights and the upgraded room was infested with ants that came and went all day long across the middle of the inside wall like a motorway. From the door frame to the plug sockets and into the bathroom. If you arrive after 9.30pm at night then forget getting any food as there isn't any, unless you want bread rolls! The staff understand this is a three star hotel at best, so they make no effort to hide this, but its much more like a 2 star. The hotel does have great views and two pools that look good on the photos. But in reality are badly kept and in need of maintenance. This was without doubt the worst holiday my family and I have ever had, all because we thought we had paid to stay in a four star hotel as advertised on the Low Cost Holiday web site and it turned out to be a three star hotel that was closer to two stars. A total rip off and I would warn everyone else NOT to book through Low Cost Holidays as they mislead you and overcharge you for the pleasure of being dissatisfied. As you can tell - we are totally disillusioned with the experience from Low Cost Holidays, the hotel standards, the price we paid and the lack of customer support to address the situation. We have just returned from this hotel and we had a great stay. We arrived mid-morning and had been warned we may not be allowed to book in till 2pm. We received a warm greeting and given our keys straight away. First impressions were good and the room was clean and all we needed and expected. The room was cleaned every day and towels changed when required. The tables around the bar and snack bar area were not always as clean as they should have been but that was the only fault we had with the cleanliness. The hotel is located on top of cliffs and has its own small beach which can be got to down about 50 steps. There is a toilet at the bottom and a bar which was open at times during the day. We walked to the resort centre several times which took us approx. 10 minutes each way. Most of the staff were quite friendly. A few of the bar staff could have tried a little harder to smile. The food was the best we have had when staying at Spanish based resorts. There was an excellent choice each meal time. The chefs were cooking in front of you so you could see all that was happening. The entertainments team worked very hard. They looked after the children at times and run events for them. For the adults there was mountain biking, archery, shooting, French bowls, darts and other activities run each day. In the evening they did all the shows. I have to admit I was pleasantly surprised with the quality and we watched every one. There are a lot of steps around this hotel so could prove difficult for anyone with any difficulties. We don’t usually go back to a hotel but this is one that we will go back to soon. When we arrived we were greeted by friendly staff at reception who were prompt to get us booked in and to our room. Room was clean with no faults. Maid came in every day to change towels(if needed) and was very friendly. Breakfast, dinner and evening meal were all served in the traditional buffet style which surprisingly did not effect the quality of the food. Some of the meals seemed repetitive but there was enough choice for something different each day. Snacks were served outside at the bar all day where you could get burgers, hotdogs, chips, toastes, salade, ice cream plus others. The hotel pool was cleaned each day and you were able to get a thin matress for your sunbed (enough for everyone. There was a small private beach where only residents could use. Kayaks were available to use for a few hours each morning which we really enjoyed, not forgetting to take bread to feed the fish, its good fun! Entertainment both during the day and on the evening was to a high standard. During the day there was a kids club and for the adults you could play darts, have a go at archery, shotting or french bowls. There was also ping pong competitions and if you were feeling adventurous you could maybe go mountain biking which was good fun, but only until you got back to the hotel. The ride just points out how unfit you are and lets you know how much you drank the night before but surprisingly we enjoyed it overall. On the evening there was a mini disco for the kids then a game of bingo then about 10pm the entertainers would put a act on, some included disco night, grease night, sketches, western night, blues brothers(unmisable). I m sure that everyone who watched the acts thoroughly enjoyed their night. We would definately go back to this hotel in the future! club portinax ibiza was great value for money. very friendly, food great for meat eaters but a bit limiting for non-meat eaters, but dont let that put you off- you have to be creative with having a few extra courses at meal times. lots of things to do, for both adults and childrens. Shame we didnt buy the CD-kids loved the "ch ch oua" song in the mini disco, and keep singing it, but we cant find it anywhere on internet-someone please help? Please! overall, would recommend this for a really nice relaxing break. In Oct, it was quiet and relaxing, but not sure how it would be in the summer, tho. Hi, we are just back from a week in club hotel portinaxt & we all had a great time. The hotel was very clean & had loads to do for children & adults including; shooting,darts,volleyball,football,mountain bikes,archery,cannoe & windsurfing and all for free. It has it's own private beeach with bar also all inclusive. The food was great you could eat allday upto 9pm if you wanted too plenty of choice for all. The location was good if you are looking for a quiet resort there are bars,clubs and shops not far. There are buses which can take you to ibiza town as well. The staff were all great and very helpful & can speak in many different languages. Entertainment well what can i say, i haven't seen better in all my holidays they are great and entertain all ages. Very friendly. yes i would revisit this hotel as i had agreat holiday and cant fault this hotel or entertainment. If you want a nice quiet Hotel,with fantastic scenery, with lots to do, then this is the one. Its the only All Inclusive Hotel that has just about every drink(Spirits) plus usual beer on tap. Also all soft drinks freely available,(no asking at the bar) just get what you want when you want, plus a wide range of snacks, Toasties, Burger buns, Hot dogs, chips, etc,etc from the snack bar area. The restaurant food was Hot & of good quality. The salad/cold meats also were great, something to suit everyone. The entertainment provided by the resident team was excellent.